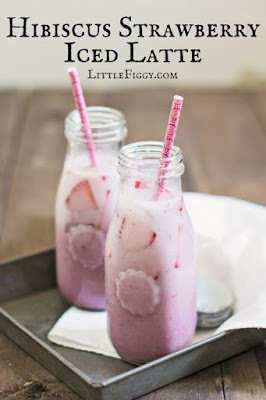 So easy to make and so refreshing, Hibiscus Strawberry Iced Latte. My version of Starbuck's, Pink Drink. I’m a huge strawberry fan, and right now they are in season around here! Yah! Of course you can make the drink from frozen strawberries too, but if you can throw in a few fresh, it adds an oomph of amazing to your drink. Let the Tea bags brew for about 5 - 10 minutes for a good concentrate. Discard tea bags. In a blender or with a fork, puree the 8 Strawberries, then mix into the Tea concentrate. 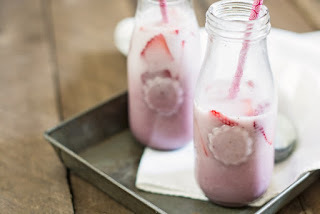 To serve, in a glass add some ice, then pour about an ounce of the Tea and Strawberry concentrate into the bottom, top off with Coconut Milk and a few slices of Strawberries. (I use about 1 part Tea Concentrate to 2 parts Coconut Milk. Adjust to taste. ).